No matter what type of person you are—an outdoor enthusiast, a restaurant lover, or anyone else—you’ll find your perfect weekend escape at Brownsburg, IN. 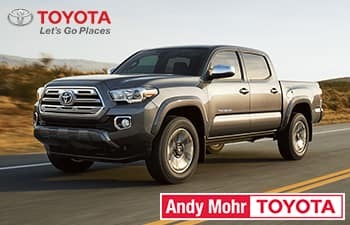 At Andy Mohr Toyota near Brownsburg, IN, we want to help you see the sites of this city with a dependable used car by your side. Fortunately, our used car dealership comes outfitted with a large collection of pre-owned sedans, trucks, SUVs, and much more. With our selection, you’ll quickly identify the ride that’s ideal for your family’s next adventure. While you’re searching for a reliable automobile, it helps to be presented with a wide variety of options to choose from. At our used car dealership Brownsburg, IN, that’s exactly what you’ll discover once you walk through the doors of our showroom. So, whether you’re interested in checking out our lineup of sporty sedans, powerful SUVs, or any of type of vehicle, you and your family will effortlessly choose the option that’s best for your needs. In addition, our dealership comes adorned with a team of professionals who’ll provide you with more information on the standard and optional features included in your favorite pre-owned automobile. By consulting our knowledgeable representatives, you’ll be sure to select the vehicle that’s equipped with the advanced technologies you want most. Congratulations! You’ve completed the first step of your used car shopping experience. Now, you’re ready to begin working on your purchasing procedures. Luckily, you’ll be guided through every step by our team of financing and leasing experts. To start, we’ll take a moment to sit with you one-on-one and review more about the budgetary requirements that are right for your family. After we’ve established those details, our staff will design a customized payment plan with your needs in mind. That way, you can drive home feeling happy that you secured fair loan options on your used car. On top of that, our dealership offers up a collection of ever-changing specials on different pre-owned automobiles throughout the year. With these convenient incentives, you may be able to get your hands on the used vehicle of your dreams even more easily than you thought possible. Take advantage of these exclusive offers by visiting our Used Car Specials page! You love to keep your automobile performing like a champion. So, if you can’t remember the last time your used car saw the inside of a service facility, look no further than our state-of-the-art repair center. Here, our trained technicians will go above and beyond every time you visit—no matter if you need a quick checkup, a more complicated replacement, or anything in between. Thanks to our dedication to quality service, your automobile will be repaired using only the highest quality tools and genuine parts. That way, you’ll trust that every adjustment was made with care and attention-to-detail. To reserve your next appointment, feel free to head to our Schedule Service tool. Simply enter your information and your preferred date of service, and we’ll reach out to you to confirm your appointment! Visit Our Used Car Dealership Brownsburg IN! At Andy Mohr Toyota, we’re ready to help you choose a used car that’ll dominate the roads of Brownsburg, IN. Regardless if you’re planning to take your kids to Williams Park for a day of fun or revel in the beautiful terrains of Arbuckle Acres Park, our powerful vehicles will tackle your path like never before. Don’t hesitate to explore more of our pre-owned automobile inventory. Stop by our showroom or schedule your test drive today!